There are some fantastic sets being released this month. 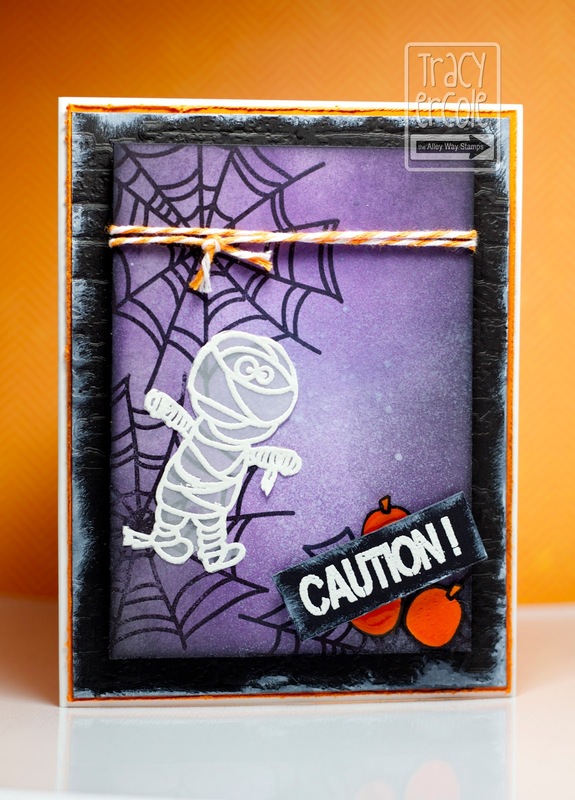 I used the 'ghoul friend' set to make my card, I used four images from the set. It is my first ever halloween card as we don't celebrate it here in Australia but I had so much fun making it, can't wait to make another! Make sure you stop by The Alley Way Stamps Blog if you haven't already, as they are giving away a stamp set each day during their sneak peeks, and you have the chance to win all three new sets during the blog hop coming up soon! Check out the blog for further details. Tracy this card is fantastic, I love the embossed mummy on vellum. So cool! Love the image, so adorable. Clever idea stamping/embossing on vellum!! AWE love your Halloween card!!! super cute with this new set! 61 days till Halloween!! !